Lang tells of a towering city of the future. Above ground, it has spires and towers, elevated highways, an Olympian stadium and Pleasure Gardens. Below the surface is a workers' city where the clocks show 10 hours to squeeze out more work time, the workers live in tenement housing and work consists of unrelenting service to a machine. This vision of plutocracy vs. labor would have been powerful in an era when the assembly line had been introduced on a large scale and Marx had encouraged class warfare. The missing footage restored in this version comes to about 30 minutes, bringing the total running time to about 150 minutes. 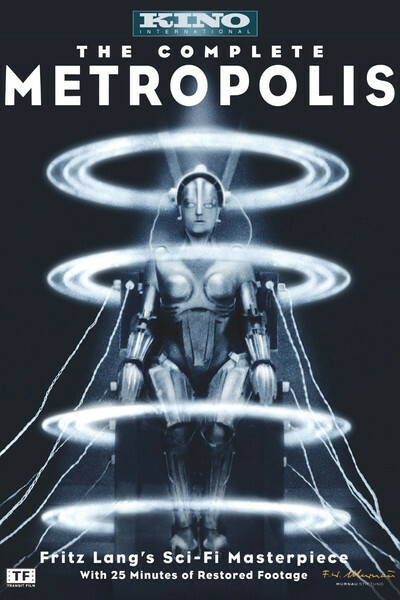 Bordwell, informed by the chief restorer, Martin Koerber of the German Cinematheque, observes that while the cuts simplified “Metropolis” into a science-fiction film, the restoration emphasizes subplots involving mistaken identities. We all remember the “two Marias”: the good, saintly human and her malevolent robot copy, both played by Brigitte Helm. We now learn that the hero, Freder, also changes places with the worker Georgy, in an attempt to identify with the working class. Freder's father, Fredersen, is the ruler of Metropolis. The purpose of the tall, cadaverous Thin Man, assigned by Freder's father to follow him, is also made more clear. And we learn more about the relationship between Fredersen and the mad scientist Rotwang, and Rotwang's love for the ruler's late wife. This woman, named Hel, was lost in the shorter version for the simplistic reason that her name on the pedestal of a sculpture resembled “Hell,” and distributors feared audiences would misunderstand. “Metropolis” employed vast sets, thousands of extras and astonishing special effects to create its two worlds. Lang's film is the summit of German Expressionism, with its combination of stylized sets, dramatic camera angles, bold shadows and frankly artificial theatrics. The good Maria, always bathed in light, seems to be the caretaker of the worker's children — all of them, it sometimes appears. After Maria glimpses the idyllic life of the surface, she becomes a revolutionary firebrand and stirs up the workers. Rotwang, instructed by Fredersen, captures this Maria, and transfers her face to the robot. Now the workers, still following Maria, can be fooled and controlled by the false Maria. Lang's story is broad, to put it mildly. Do not seek here for psychological insights. The storytelling is mostly visual. Lang avoided as many intertitles as possible, and depends on images of startling originality. Consider the first glimpse of the underground power plant, with workers straining to move heavy dial hands back and forth. What they're doing makes no logical sense, but visually the connection is obvious: They are controlled like hands on a clock. When the machinery explodes, Freder has a vision in which the machinery turns into an obscene, devouring monster. Other dramatic visual sequences: a chase scene in the darkened catacombs, with the real Maria pursued by Rotwang (the beam of his light acts like a club to bludgeon her). The image of the Tower of Babel as Maria addresses the workers. Their faces, arrayed in darkness from the top to the bottom of the screen. The doors in Rotwang's house, opening and closing on their own. The lascivious dance of the false Maria, as the workers look on, the screen filled with large, wet, staring eyeballs. The flood of the lower city and the undulating arms of the children flocking to Maria to be saved. Much of what we see in “Metropolis” doesn't exist, except in visual trickery. The special effects were the work of Eugene Schufftan, who later worked in Hollywood as the cinematographer of “Lilith” and “The Hustler.” According to Magill's Survey of Cinema, his photographic system “allowed people and miniature sets to be combined in a single shot, through the use of mirrors, rather than laboratory work.” Other effects were created in the camera by cinematographer Karl Freund. The result was astonishing for its time. Without all of the digital tricks of today, “Metropolis” fills the imagination. Today, the effects look like effects, but that's their appeal. Looking at the original “King Kong,” I find that its effects, primitive by modern standards, gain a certain weird effectiveness. Because they look odd and unworldly compared to the slick, utterly convincing effects that are now possible, they're more evocative: The effects in modern movies are done so well that we seem to be looking at real things, which is not quite the same kind of fun. The restoration is not pristine. Some shots retain the scratches picked up by the original 35mm print from which the 16mm Buenos Aires copy was made; these are insignificant compared to the rediscovered footage they represent. There are still a few gaps, but because the original screenplay exists, they're filled in by title cards. In general, this is a “Metropolis” we have never seen, both in length and quality. Although Lang saw his movie as anti-authoritarian, the Nazis liked it enough to offer him control of their film industry (he fled to the United States instead). Some of the visual ideas in “Metropolis” seem echoed in Leni Riefenstahl's pro-Hitler “Triumph of the Will” (1935) — where, of course, they have lost their irony. “Metropolis” does what many great films do, creating a time, place and characters so striking that they become part of our arsenal of images for imagining the world. Lang filmed for nearly a year, driven by obsession, often cruel to his colleagues, a perfectionist madman, and the result is one of those films without which many others cannot be fully appreciated. Note: Some of the restored footage shows small black bands at the top and left side, marking missing real estate. Expert projectionist Steve Kraus says this image area was lost due to shortcuts taken either in making the 16mm negative or quite possibly years earlier when the 35mm print they worked from was made. This article is based in part on my 1998 Great Movies essay.